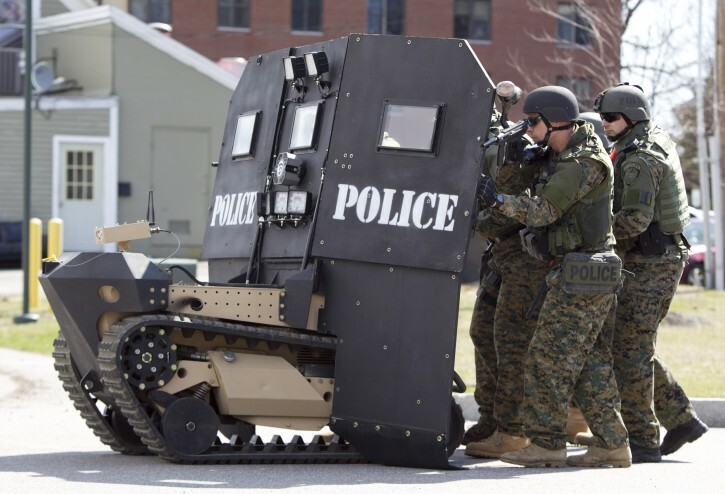 I have been considering some of the practicalities of bringing tactical cybershells into action. A multi-legged system such as a Kumo-607 can probably move quite swiftly but will still be slower than a more conventional vehicle. Many tactical robotic systems such as cyberswarms and snakebots are smaller and slower than the Kumo so will also need some form of transportation. The human elements of a platoon will also need a means of transport. The obvious solution is some form of armoured personnel carrier (APC). These will be in use in the TS-era and will be designed to transport a greater variety of passengers. Cybershells of all shapes and sizes will travel both inside the vehicle and clinging to its exterior. Various nooks and crannies will be used for swarmhives. RATS on the outside of the vehicle will effectively act as additional weapon turrets. The APC is not the only option of ground vehicle. A friend of mine often remarked that if troops had an adequate level of body armour then armouring their transport was not such a high priority. RATS can be transported in trucks, pickups and SUVs, these vehicles themselves likely being driven by an AI. This option is particularly attractive in scenarios where a military unit does not wish to overtly advertise its movement. If the vehicle is disabled by some means the unit simply commandeers a nearby civilian vehicle and occupies it. Perhaps the military driver program can be plugged into other vehicles and includes a “hot-wire” suite to override civilian vehicle security systems. This would make such a driver program attractive to some of the criminally inclined! A squad does not all need to travel in a single vehicle. Suppose we provide the unit with a number of small tracked vehicles similar to the minirip or the slightly larger ripsaw? A single minirip could carry a Kumo-607 type RATS or a human in a battlesuit and still have room for a number of smaller systems and additional stores. The ripsaw could carry a couple of large RATS and a human passenger in the seat. Or the seating space could carry additional systems or stores. In effect we are considering something along the lines of a tracked vehicle that serves as a warhorse/packhorse that the combat system can ride to the battle and return to for transport or extra ammunition/equipment. The vehicle itself would have its own AI and possibly some armament. This allows the vehicle and its rider to act as a team. For example, several Kumos ride to a building on their tracked carriers. While they dismount to search the building or climb up its outside the carriers establish a defensive perimeter and assume overwatch.